Even under the strictest health and safety, occupational health and environmental risk assessments, the HLD4 requires minimal consideration. 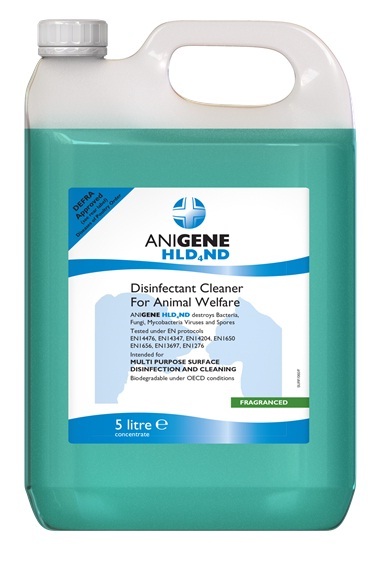 The synergistic blend of active and inert ingredients enables ANIGENE HLD4ND to work quicker than comparable disinfectant products. Remove debris by rinsing and soak in 1:50 (2%) disinfectant solution for 20 minutes. Remove, rinse, leave to dry. GROOMING TOOLS, FOOD and WATER BOWLS, LITTER TRAYS, etc. See Application Sheets for further information. ANIGENE HLD4ND is manufactured in accordance with quality Management System ISO 9001 and is biodegradable under OECD conditions. The HLD4 formula is Article 95 compliant and is being supported through the Biocides Products Directive.